Manchester United star midfielder, Anderson (Anderson Luis di Abreu Oliveira) is lucky to be alive following a horrendous crash in Portugal early Sunday morning. It's reported that Anderson was a passenger in the white Audi R8, which according to Britain's Daily Mail, "... slid off the road and hit a wall before flying 100ft through the air and landing in a field." 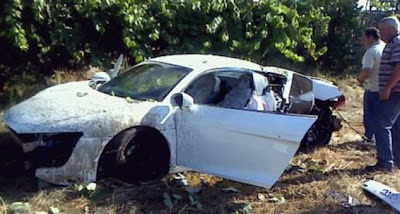 Following the accident, Anderson was reportedly pulled "unconscious" from the wreckage, moments before the R8 exploded. Although the R8 carries only two seats, the Daily Mail notes: "The Brazilian [Anderson] was believed to be travelling with two friends, a man and a woman, when the accident occurred." Luckily no one involved was seriously injured.